Material. Digital glaze image fused to 35011.75 x 10” ceramic tiles. Dimensions. 14.6 ft high limestone columns. Each have 4 faces, comprising 60” h x11.75” w.
Commissioning Agent. Michigan State Development Office, East Lansing Michigan. 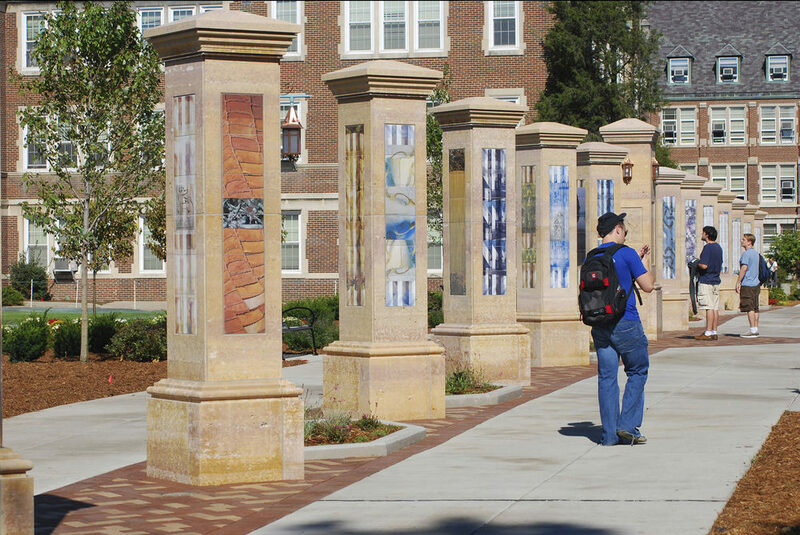 Designed and fabricated 336 ceramic tiles for Michigan State University's recognition of their most generous supporters. The subject matter on each face varies greatly, and is unified by 4 tonality changes that represent the 4 seasons and are aligned to north, south, east and west views. All faces began with original photographs. Content on each face is different, but all are somehow connected to the University’s history, it programs, student life, its well-known landmarks. 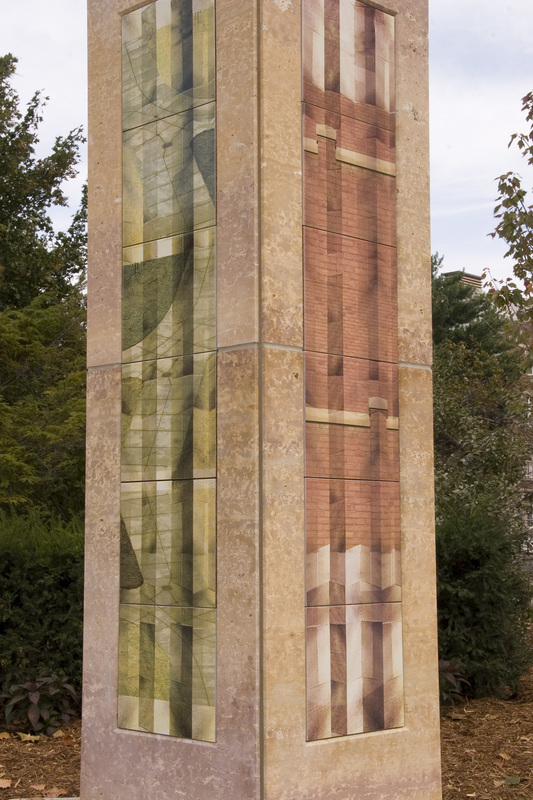 Each year, as Donors contribute to the school, the art tiles are replaced with Donors names prominent and the original artwork slightly ghosted behind. 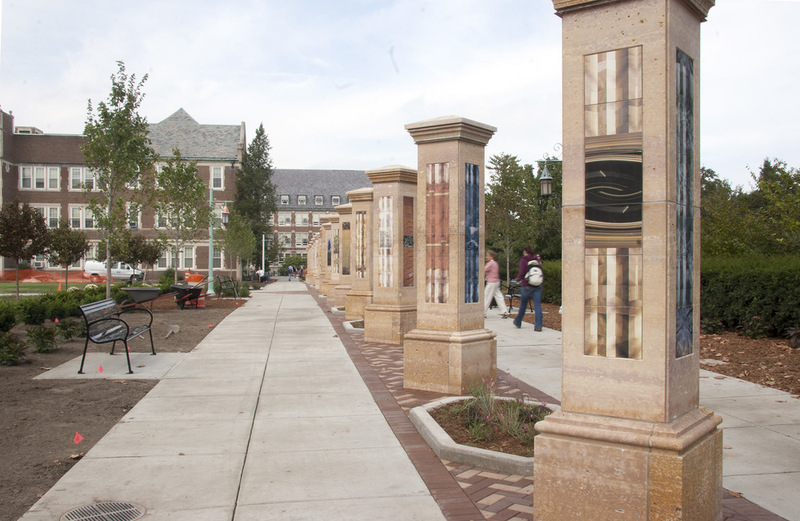 The landscaped site has become a destination for Alumni, old and new. It is living memorial to the years of generous giving that supports and endows this academic institution. Michigan State Campus. East Lansing, MI. copyright © 2004-2018 In Plain Sight, LLC. All Rights Reserved .